Creating porcelain jewelry allows me to sculpt and paint, using clay and glazes. My porcelain jewelry (earrings, pins, and necklaces) is sculpted in high-fire (cone 10) porcelain and is fired several times. To achieve hardness and durability, it is fired to 2400 degrees. Colors are produced by using a variety of glazes that I have developed. The precious metals (24-karat gold, and white gold) are applied before the last firing to accent and infuse the pieces with a lustrous finish. The necklaces are often reversible, and are direct impression of driftwood or stones from Gros Morne National Park, a World Heritage Site, in Newfoundland. 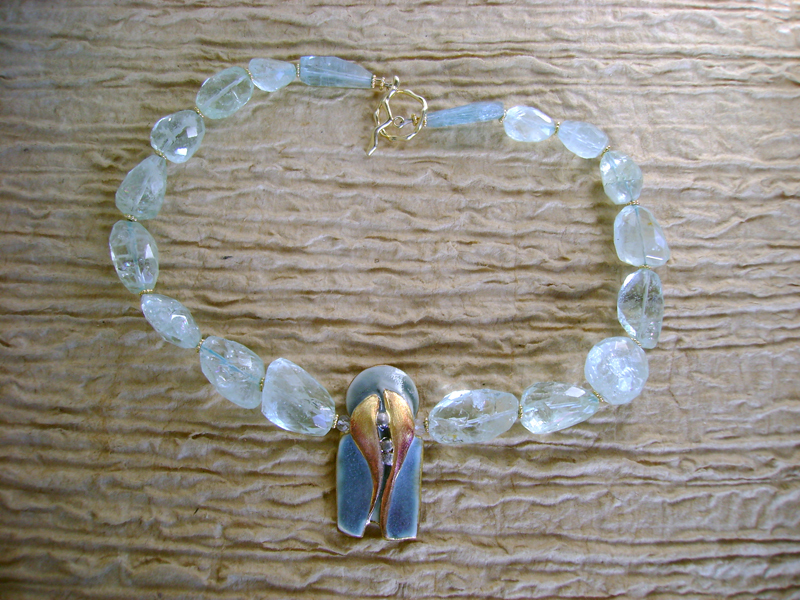 My designs are inspired by nature in all its wondrous complexity of sky, land, water, and the fire of the living Earth. It is through the process of sculpting, glazing, and firing that I attempt to instill each piece of my jewelry with my feelings about nature. I create my reversible, marbled birch earrings by first shaping the birch wood and then, using acrylic paint, marbling them on both sides. Each piece is unique and light as a feather. The final coat of shellac is applied for durability. To enjoy the reverse side, simply remove the earring from the earwire and insert it back in with the desired orientation, or insert it from back of the earlobe if the finding does not allow that.